Five days after threatening to pull the plug on Italy’s government, Deputy Prime Minister Matteo Salvini summoned his lieutenants to party headquarters on the edge of Milan. With polls showing that voters would swing behind his anti-immigrant League if the administration collapsed, officials were pressuring Salvini to end his frustrating co-existence with the anti-establishment Five Star Movement. Heading into that meeting last month they thought his patience might be wearing thin. They should have known better. This government will keep going, he told the group, according to two people who were present. Watch him on the campaign trail — shaking hands, embracing supporters, chatting, posing for selfies — and it’s easy to be taken in by the spontaneous homespun Salvini persona. On Twitter, his one million followers can share everything from his latest pasta dinner to the frustrations of Valentine’s Day after breaking up with his girlfriend. In private though, he is cautious and strategic, says one junior minister who’s worked alongside Salvini for some 20 years. A snap election may be tempting for the party, but Salvini is playing the long game. He is already in the box seat in the government and voters have so far blamed Five Star’s Luigi di Maio for most things that went wrong. The League needs more time to build up support in the south and if it ditched Five Star now, it might end up being reliant on former prime minister Silvio Berlusconi for a majority. The last thing Salvini wants is to wind up associated with such an establishment figure. That’s the vision. The next few weeks may test his resolve. 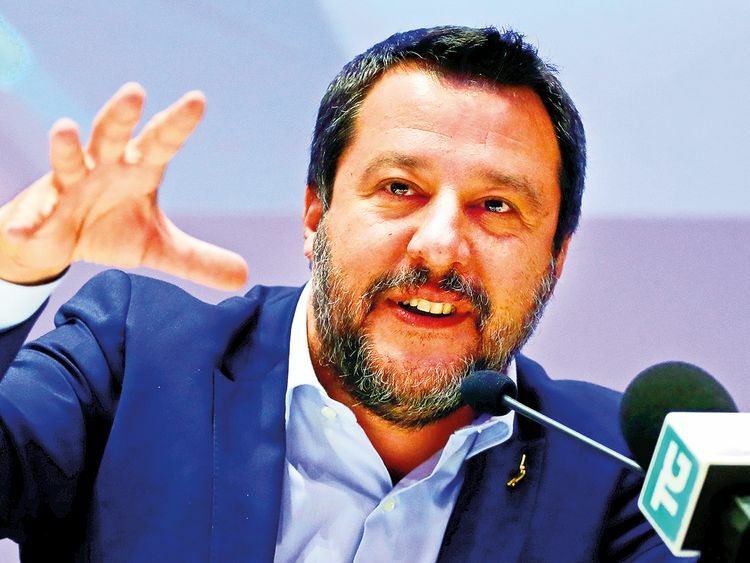 Since forging an unlikely coalition with Di Maio in June last year, the 46-year-old firebrand has become the dominant force in Italian politics and the leading light among a new generation of nationalists from across the European Union (EU) who’ll meet in Milan on Monday. 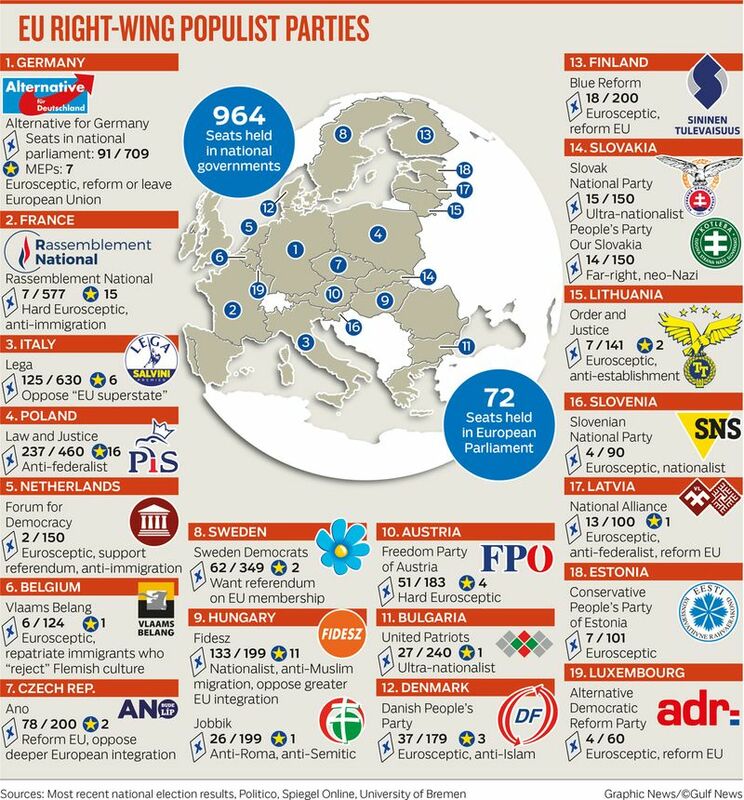 They’ve targeted May’s EU parliamentary elections as a chance to tear up the bloc’s debt rules, get a grip on the European Central Bank and start a rapprochement with Russia. This account of how Salvini turned a moribund group into a new force in Europe is based on interviews with half a dozen senior government officials and party operatives over the past several weeks. They asked not to be named discussing private conversations and confidential meetings. It’s not so much Salvini’s electoral prospects that make the EU establishment nervous. His nationalist alliance is projected to win less than a tenth of the seats in the next parliament. What sets him apart is his political chops. Since he burst onto the scene a year ago, Salvini has hijacked an EU summit he didn’t even attend, faced off with the European Commission on the budget and consistently got under the skin of French President Emmanuel Macron. And whatever he does, his popularity in Italy continues to climb. Salvini has been living and breathing politics since his teenage years. He started out as a Communist, but at the age of 17 he joined the Northern League, a right-wing group that aimed to see the industrial heartlands around cities like Milan, Turin and Venice cut loose from Italy’s poorer south. Many of those who now occupy senior party positions have been scrapping and pulling stunts for 20 years or more alongside the man they call ‘The Captain’. Every summer, many attend the party’s traditional gathering near the Italian Alps, where the diehards dress up as medieval knights to celebrate a 12th-century alliance against the Holy Roman Emperor. Salvini took over as leader of the Northern League at the end of 2013 with the party in disarray after slipping to 4 per cent in that February’s election. Founder Umberto Bossi had resigned over a corruption scandal the previous year and his successors had struggled to steady the ship. One of Salvini’s first moves was to ditch the party’s separatist tradition with a push to boost support in central and southern Italy voters he’d previously insulted. For the March 2018 general election, he dropped the word ‘Northern’ and rebranded his party as simply ‘The League’. That proved a breakthrough moment for Salvini. The party jumped to 17 per cent of the vote, displacing Berlusconi’s more moderate Forza Italia as the dominant force on the Italian right. And Salvini’s grip on the party was assured. Sealing the alliance with Five Star meant disregarding the advice of several long-time advisers and jettisoning Berlusconi, for whom the Northern League had been a junior partner in four governments. But the turnaround in the party’s fortunes means no one in the League challenges Salvini. “When Salvini took over, we were a dying party. So whatever he says is fine by us,” said Riccardo Molinari, who heads League lawmakers in the lower house. Since then, his star has kept on rising. The League trailed Five Star by 15 percentage points in last year’s general election. The latest polls show it leading by 10 points and on track to win a national election for the first time in May. Salvini has also won a string of regional elections in the centre and the south as support for Five Star has crumbled. The parties’ diverging fortunes are exacerbating the tensions in a coalition that was built across a tectonic faultline: The League’s base is in the wealthy north, Five Star’s in the depressed south. The League pushes tax cuts, Five Star welfare benefits. Executives from the north remonstrated last month with one of Salvini’s advisers over a decree hurting their business. The adviser blamed Five Star. League officials are sick of constant infighting and half of the party’s lawmakers in the lower house want to end the coalition, according to a senior member of parliament. And they expect the rough and tumble of an EU election campaign to make matters worse. Molinari this week said the party may seek to rewrite the terms of the coalition agreement if the EU vote confirms they have become the country’s biggest force. Analysts have warned for months that could trigger a snap election. If the coalition gets past that hurdle, tensions could surface in the fall as the government will have to draw up a new budget at a time the cratering economy leaves it little room for manoeuvre, an adviser to Prime Minister Giuseppe Conte said. At a closed-door meeting with some 180 parliamentarians at the lower house in February, Salvini called on his troops to stay calm and guard against overconfidence. He told them that the current coalition is the only one that’s possible at the moment, seeking to damp down the clamour for a snap election. The League needs to have the same hunger this May as it did five years ago when its fortunes were at a low ebb, he said according to an official present. Even with its recent surge in support, the League probably still couldn’t govern without Berlusconi and Salvini is wary of getting entangled with an unpredictable ally he sees as part of the discredited old guard. Instead, he’s targeting a new alliance with the far-right Brothers of Italy and potentially future defectors from Berlusconi’s group. But he needs the coalition with Five Star to hold up long enough for that new formation to build up its support. “The longer Salvini holds out, the more he can steal voters from Five Star and from Berlusconi, and build up his support in the south,” said Roberto D’Alimonte, a political science professor at Rome’s Luiss University. But Salvini’s resolve is being tested. In the weeks that followed the February pep talk, Di Maio doubled down on his opposition to a 9 billion-euro (Dh37.28 billion) Alpine rail project. Salvini and his industrial allies are backing the project which the government has already sunk some 2 billion euros into. Salvini threatened on March 7 that he could force the government to collapse “if there are too many ‘no’s”. The following Monday, some 40 League officials trailed into the former canteen that serves as a meeting room at the party’s Milan headquarters. They took their seats behind a row of desks — like schoolboys, one of them joked later. Things are tense, so don’t provoke Five Star, Salvini told them. Don’t attack the party or its ministers, he said. The League must not act like supermen. The time will come when Salvini has to take another gamble. But the odds are shifting in his favour at the moment, and he aims to put it off as long as possible.